Gudipoodi Srihari is a noted cinema journalist and the most credible movie reviewer. 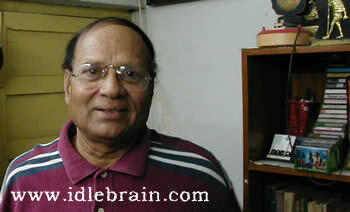 He is the official movie reviewer for the prestigious publications like The Hindu and The Eenadu Group. Idlebrain.com has caught up with him on 25th of December 2000 and spent some time listening to his views and experiences about Telugu cinema. Here are the excerpts of his interview. I did my MA in Mathematics from Delhi University. At that time, I used to teach mathematics and physics for PUC students out there. Later on I shifted into Journalism. I started writing reviews in 1969 for Hindu. Since then, I have not missed a single Telugu film. I gave all my Hindu reviews to Sundarayya Vignana Kala Mandapam for preservation. But due to last year floods, they were washed away. People call me cynic as I watch all the Telugu films. Every time a Telugu film is released, I have to undergo two punishments. The first one is watching it and the second one is writing a review on it. Who would not be interested in films in AP? I was talking about 1940's when I was a kid. I used to participate in lots of dramas. Cinema in India was just evolving at that time. Theater atmosphere used to be pretty enlivening. We had to walk miles and miles to watch a film in cinema hall. Hence, naturally, we are all fascinated by cinema. By the time, I was fully involved myself as an audience, Nagayya's prime time was over. I watched his films like Tyagayya and Bhakta Potana, when I was a kid. During that period, Ch. Narayana Rao was the big hero. He prevailed as the prime hero even after ANR and NTR entered into Telugu film Industry. People were in awe of Ch Narayana Rao. If you watch his films now, they may look strange. Kanchana Mala used to be called as Greta Garbo of Telugu cinema. Let me tell you the various periods. When I started understanding what a Telugu cinema is, ANR was the popular hero who was growing up. After five years, NTR entered the industry with 'Mana Desam'. Then ANR and NTR started vying for the top slot as hero. But, cleverly, they have chosen two different platforms. NTR was branded as Mythological hero with a film in which he played Lord Sri Krishna. With Mayabazaar, he became the supreme of mythological films. ANR has chosen love subjects and remained as the class hero. For any language, theater paved the way to cinema. Likewise, all the Telugu actors and actresses for cinema were drawn from the stage theater. Initially, acting and dialogue telling/singing used to be done at the time of shooting. An array of musicians used to sit at the shooting spot. The actors/actresses used to tell dialogues while musicians played music. This entire process is recorded as the camera is rolling. Slowly the technology has advanced and play back singing has come into the place. I must tell you an interesting fact about the playback singing. The fall of standard of Telugu cinema has started at this point of time, when playback singing was introduced. The first singer used to MS Rama Rao. Later on Ghantasala entered playback singing and he became the supreme and ruled it till his last breath. Then Madhavapeddi Satyam joined. Later on, lots of singers came into the scene. Introduction of playback singing has taken away the crooning aspect of the actors. In between a song, there used to the a few dialogues. The playback singers too perform those dialogues. At that time people used to concentrate more on story. In those days, lots of social films used to come and all the writers who used to write for social stage did migrate to Telugu cinema. There used to be 'Praja Natya Mandali' (Left oriented) during the days of freedom struggle. They adapted all the types of folk arts like hari katha, burra katha, dappu to propagate leftist movement. Lots of people have come from theater at that time. There were talented outsiders too like Samudrala Raghavacharya. Slowly, they improved the quality of cinema. They used to sit on a story for 6 to 7 months to develop it. Then they used to prepare script and screenplay, Later, they narrate each and every dialogue to the artist before starting the shooting. They used to have the entire cast doing rehearsals. After the shooting is over, lot of time was spent on editing. KV Reddy used to estimate the length of shot in the planning stage and write it in the script itself. Then he used to order raw film in accordance with the estimation done during the script stage. KV Reddy was one of the most economical directors. At that time, raw film used to be a scarce commodity due to the Second World War. That is one of the reasons why the time duration of the cinema was brought down. In those days, film used to be of 3:30 hour to 4-hour duration, which means that footage is of 20,000 feet to 24,000. Due to the raw film shortage problem, the film's length was brought down to 16,000 feet. It was like blessing in disguise. Otherwise watching a 4-hour film would have been painful today. After making the perfect script, they used to brainstorm about casting. Plenty of artists were available. They were hired on unit basis and paid salaries for their work, which is considerably higher than what they could have earned otherwise. Though they were paid very less considered what the stars are paid today, once the movie becomes a big hit, those artists were hailed as gods. There used to be no vulgarity in the films. The period between 1950 and 1970 is hailed as the golden era of Telugu cinema. ANR and NTR used to have consciousness effort that vulgarity should not be there in their films. They used to make the script change, if that film demands any vulgar scenes. There used to be plenty of stories at that time. Even if you watch old films on TV today, they hold your interest. I am talking about he times of BN Reddy and KV Reddy. Later on, a new crop of directors has come in. Aadurthy Subba Rao was one of them. K Vishwanath was a technician at that time. During the golden era of Telugu cinema, there used to be lot of influence of Bollywod and Hollywood on our films. Telugu cinema used to follow Bengali novels for idealistic themes. There used to be a few Telugu lady novelists, whose novels used to be adapted for Telugu films. Later on the Krishna and Sobhan Babu era started and cowboy films have come in. Sobhan Babu and Krishna joined the industry when the good era is fading off. Initially, they have done good standard films. But slowly the western influence started on Telugu cinema in the form of James Bond films by Krishna. The James Bond image has brought him into the limelight. Without James bond films, he would not have survived long in the industry. Audiences too wanted some change in the films and James Bond genre clicked. That is the stage where the economics of filmmaking have changed. In 1980's, the cost of filmmaking has gone up. Before that ANR used to charge 4 and half lakhs per film. NTR, being a mass hero, used to get 5 to 6 lakhs a film as remuneration. With Dasari - NTR combination films like 'Sardar Papa Rayudu', NTR's remuneration was made 10 lakhs. With K Raghavendra Rao - NTR combination films like 'Adavi Ramudu', NTR charged 14 lakhs a film. At one point of time, ANR wanted to retire from the film industry due to health problems. But, his doctor wanted him to work more in the films to overcome the health problems. He continued acting. Even today, in his 70's, he is still a hot property. The economics of films have changes with the advent of Krishna, Sobhan Babu, Krishnam Raju and Chiranjeevi. The hero started becoming the most important aspect of the film. Image building of a hero started. And the rat race has begun. It was a helplessly unhealthy trend. People started dictating the number one, two and three positions by the artist's remuneration. If this is the consideration, Nagayya used to be paid one lakh in 1940's per film (only hero with stardom at that time). If you take the inflation and interest rate, he would have been receiving more than Rs 8.192 crores per film in the present year. He spent all the money in charity and had no money during the fag end of his life. ANR used to tell me that he learnt two lessons from Nagayya. The first one is how to stay on top by doing excellent roles. The second one is not to donate money for the unworthy people (apathra daanam). As the heroes started asking for more money, other actors too jacked up their remunerations. Among the technicians, dance masters and fight master have become more important and they too started demanding more money. Music directors were always at the receiving end till Ilayaraja entered the film industry. In Telugu film industry, there was never a music director who matched Ilayaraja in demand. If you take today's scenario, Mani Sharma is on top, as his films are becoming hits. Chakravarthy entered the field to become an actor. Then he became a dubbing artist and then a music director. He is one of the most successful Telugu music directors of Telugu cinema. He confessed to me that most of his producers did not pay him money. That was the pathetic situation the Telugu music directors had. During this period, the industry started shifting towards Hyderabad as the AP Government announced subsidies for those films that are made in AP. This process was booted during the period of Sanjeeva Reddy. Then Brahmananda Reddy gave the momentum. Chenna Reddy tried to do his best. But, it was Jalagam Vengala Rao who gave the biggest boost. Jalagam Vengal Rao has taken the film industry 20 years ahead in his tenure. I can vouch the state was developed and taken us 20 years ahead with his rule as CM. The Banjara Hills and other cinema related places were allotted during his tenure. Vengal Rao started FDC (Film Development Corporation). APFCC (Andhra Pradesh Film Chamber of Commerce) was initiated by Chenna Reddy. But Vengal Rao increased the entertainment tax from 2% to 7%. Nobody should forget history. I am sorry to say that the people who have done great things are easily forgotten, as they did not use media to publicize themselves. But the people who create media hype without really doing any development for the state gets more publicity. They can't cheat people for long. They will perish. That's why I regard Jalagam Vengal Rao as the person who did develop Telugu film industry in AP phenomenally. Even NTR has told me that it's Jalagam Vengal Rao who was responsible for Telugu film industry for developing in Hyderabad. Jalagam Vengal Rao granted the land for NTR over the discussion table, immediately after NTR requested for it. During Brahmananda Reddy period, 'Brahmananda Chitrapuri' was developed on the Bejawada road. There used to be two huge structures over there. One is by NTR and other one is by LV Prasad. There used to be undercurrent enmity and jealousy among the top people in Telugu film industry. NTR and ANR were the biggest rivals at their peak time. ANR shifted to Hyderabad for his own reasons. Hence, all the producers of ANR started making films in Saradhi Studios in Hyderabad. Then some kind of rupture took place between ANR and Saradhi management. Then ANR started constructing his own 'Annapurna Studio'. And he constructed it extremely well. He, himself, was the engineer. Since, ANR acted in so many studios, he found lots of faults in them and based on his experience he designed 'Annapurna Studios'. And it proved to be one of the best studios in Asia. Later on NTR shifted to Hyderabad and constructed his studio on his own land. He did not use the land donated by the government. At that time (Vengal Rao period), it costs 4 anas per square yard in Banjara Hills. MLAs used to question Vengal Rao in assembly for giving ANR the land in Banjara hills for a cheap rate. Then Vengal offered all the interested MLAs the same rate on a condition that they too should develop cinema industry. Nobody had the courage to buy that land in that place, as it was a wasteland. ANR has the courage to construct a studio in Banjara Hills. Because of the glamour of films, that area slowly developed and now you know what Banjara Hills mean today. The rivalry between NTR and ANR was extended to starting of studios in Hyderabad. But NTR listened to wrongly advising people at Madras. The Madras studios owners realized that if Telugu film industry moves to Hyderabad, their studios would not have proper feeding. They tried to stop NTR from migrating to Hyderabad. It took almost 30 years to shift from Madras to Hyderabad. And today, people opine that the quality of Telugu cinema has gone down because it is shifted to Hyderabad. There used to be competitive feeling at Madras as Telugu, Tamil, Malayalam and Kannada films are made at the same place. Since, Telugu Industry is moved away, it worked in isolation without any competitive comparison among the films from various languages. Cost of production was escalated and movies were made with a high budget of two to three crores. Producers incurred heavy losses if a film flopped. Lots of distributors disappeared over night. The way films are made also changed. In the earlier days, the distributors (Navodaya, Annapurna etc) used to finance films. So, the profits of the film are given to the distributors first and then the producer used to get his share. Later on the financing aspect is shifted to film financiers who charged hefty interests. Later on buyers system started. If a Chiranjeevi - Raghavendra Rao combination film is announced in 1980's, all the buyers from AP used to gather to give money. Nobody bothered what the story of the film is all about. Initially, the producer has taken enough care to deliver hit films. Later on, it has become a formula machine with six songs and six fights. Then the slump came in. There are at least 4 times the slump has effected due to this mechanical process, which lacked creativity. And the distributors are the big losers and they disappeared overnight. This system has frightened the regular traditional producers and they stayed away from making films. The businessmen and contractors started entering the production business. They used to make flop films. K Vishwanath's Shankara Bharanam was released at a time when the industry was in a slump. I saw the film's preview. Vishwanath was tensed that his film is releasing in an atmosphere where action and romantic films were making most of the hay. The film Shankarabharanam moved me. May be, our culture and my own experiences has caused a tilt towards that healthy cinema. Shankara Bharanam was released in a remote theater on a contract for 7 days. The film started with empty hall on the day one and become the biggest hit as the audiences gave a good feedback. K Vishwanth became a trendsetter. T Krishna, who made Prathighatana, too is a trendsetter. Panuganti Lakskhmi Narasimha Rao has written in his 'Saakshi' about Goddess Saraswati. He has written about the standard of education going down from year to year in his works referring to Goddess Saraswati stepping down day by day. Likewise, Telugu cinema too is coming down day by day. We need to talk about Government's policies towards films. A film that is released with more than 24 prints is called a big budget film and a film released with 24 or less number of prints is called a small budget film. Then they fixed 8% for small-budget films and 16% for big-budget films. Later on that policy was changed. The first one is subsidy system for making films in AP. The second system is slab system. Slab system means there would be different tax rates on the type/location/facilities of the theater. There used to be a malayali film producer in AP, who was the son of IG of Police, AP during the tenure of Vengal Rao. At that time, a film used to cost 3 - 4 lakhs for producing in AP. Government used to give a subsidy of 1 lakh. That gentleman used to shoot the entire film in a hall with unknown actors and used to claim Rs 1 lakh from the government. Then the government restricted the subsidy to only Telugu films and Telugu producers. The solution is to make small budget films with new and young talent. Avoid stars and the highly paid character artists. They have to make comedy films like Jandhyala. The middle age people who are sticking to TV all the time will come to theaters only to watch comedy films. As for as the exhibition is concerned, we must have multiplexes (a groups of small theaters in the same complex). In the future, there would be one day, where the entire theaters exhibiting a film all over the state will have a centralized station at a place and the film would be broadcasted from there. The censor committee is not committed to do a fair job. They have accepted money and given good censor certificate for the vulgar films. Hence, the audiences should reject the bad films that propagate vulgarity. Recently, a vulgar film titled 'Bad Boys' was released. I am happy that people have rejected it. If you put vulgarity, double entendre etc in a film and release it, it may become success for the first time because of its shock value. The first vulgar film of that genre was 'Bachelors'. It was hit and the all the films that followed 'Bachelors' were flopped. They even had a reference to masturbation in that film. I fail to understand why the censor passed that scene. The other factor is thats the government is unable to pay the money for the subsidies it has announced. Government has no money to conduct Nandi awards function. It has never happened when Congress was ruling AP. There were lots of controversies about Nandi awards this year. We have to think from another aspect too. It is been 35 years since Telugu cinema moved from Madras to Hyderabad. Its unfair to expect subsidies from the government as Telugu cinema should have become self-dependent by now. Lots of studios have come up and most of them are not running to their full capacity. Ramoji Film City has come up too. Ramoji Rao knows that shooting Indian films alone would not be sufficient to get the investment back. He is concentrating on getting Hollywood films shot at RFC. Our producers are capable of getting good scripts written for their films. But they are going to Tamil hits and remaking those films, as they are safe bets. They are also importing the Tamil director to direct the Telugu version. This remaking system is running for a long time and most of the big producers are involved in these remakes. I was a member in Nandi awards committee for six times. It used to be a big problem for us to make the films qualify for the selection. We avoided remakes. Then there are copied films. The directors shamelessly copy the films without paying royalty or giving credits. Somebody told me that Mahesh Bhat used to carry a handheld video player that plays the 'Fugitive' film and directed 'Criminal' (Nag & KS Rama Rao). He used to show the videotape to the artists and ask them to act the way actors have performed in 'Fugitive'. The order of the day is to make small films and bring down the cost of production. Chitram was made with a budget of 30 lakhs. Nuvve Kavali was made with a budget of 1 crore.
' that has become a big hit this year. This movie is all about 'wife beating'. Even if you take 'Nuvve Kavali', there is no such potential material in this film to become such a big blockbuster. This proves the old adage: 'Edaarilo Aamudapu Chette Maha Vruksham'. Incidentally both these films are remakes.
.' whenever they have a dialogue to tell. You can take a bunch of college guys and make a film with them. It may become a hit. But this trend would be there for a couple of years. Any cinema cannot survive if it does not have dramatization. Behaving in the films is a fad now. It will fade away, eventually! Sobhan Babu says he is the casual actor and he introduced casual acting in Telugu films. Krishna can never be a casual artist. Even if he speaks normally, you can feel lot of dramatization in it. If you look at NTR's social films, there is a casual action by him. But at the same time there is a very calculated subtle dramatization in his expressions. He was very dramatic in mythological roles. ANR has a lot of dramatization in his action. The new generation calls his acting as artificiality. Even CSR was a casual artist. Ch Narayana Rao has little bit of dramatization in his action. Govindarajula Subba Rao was highly dramatic in his action. SV Ranga Rao. Even in mythological films, he used to say his dialogues casually. He is such a great actor that he used to take very lengthy dialogues and utter them casually and get more impact than what a dramatized dialogue could give. In actresses, Suryakantham is a great casual actress. But over a period of time the mannerisms of SV Ranga Rao and Surya Kantham got branded. Kaikala Satyanarayana is the only actor who can match up to SV Ranga Rao's personality and diction today. There used to be combinations in the old times. ANR and Gummadi is one combination. NTR and SVR is another combination. In the films, the reaction is as important as action. Reaction is to show expressions, while the other artist is uttering dialogues. Because of escalation in the costs, the making of films is become a multilingual process. Most of the big-budget films are made in three languages (Telugu - Tamil - Kannada) to absorb the production costs. Films like Roja, Bombay, Bharateeyudu and Oke Okkadu are made with that intention. The hero is forgotten if three films of his are failed. What happened to Nagarjuna today? At one point of time, Nagarjuna was far ahead than Venkatesh though both these actors are comparable. An intelligent father who is good filmmaker supports Venkatesh. Checkout the singers today! Udit Narayan charged 50,000/- for 'Ramma Chilakamma' song from 'Choodalani Vundi'. At that time Balu was charging 10,000/- to 12,000/- a song. Today, even a small budget filmmaker wants Udit Narayana, who can't pronounce the Telugu properly. Half of the downfall of Telugu cinema can be contributed towards the foolishness of Telugu filmmakers. Songs by Udit Narayan and other language singers and the shooting songs in abroad is costing around two crores a film. The maximum amount charged by any Telugu singer so far is Rs 30,000/-. Why are they inviting Udit Narayan who can't even pronounce Telugu properly and giving him Rs 60,000/-? I will tell you something strange that has happened for a song in Sultan. There is one song written by Veturi, which has 'Jabilli' word in the lyric. That singer Sukhwinder Singh got a doubt about lyric. He asked Veturi why should we have the word cat (billi) in a romantic song? And he charges Rs 40,000/- per song. There is a unanimous talk in the entire industry that all the Nandi awards are given to wrong choices. Even the function held to present the awards was lackluster. In fact, the small organizations that presented awards this year have better choices for the awards. Mayabazaar is the textbook of filmmaking. Who is the hero of that film? ANR, NTR or SVR? The story is the hero. Then comes Shankarabharanam. It's a trendsetter. After watching Shankarabharanam, lots of youngsters join music schools to learn classical music. K Vishwanath could not repeat the magic later. If he had changed the climax of 'Swati Kiranam', this film too would have become a big hit. I like the name a lot. It sounds to me like idiot box (TV). Why a TV is called an idiot box? Do you think only idiot watch the TV? It's for everybody's entertainment. Likewise, idlebrain is not just for the people who do not have any work. Idlebrain makes other brains active. For example, you made my brain active by making me go into my flashback and tell you so many things. I do visit idlebrain.com regularly and enjoy reading the content in it.